[New for 2012, lasted only through 2013] So, are you a carrot cake addict like me? Are you excited for buffets because for some strange reason there's always a carrot cake option for dessert? Did you use to eat those easy bake carrot cakes for lunch in college? Ok, I probably lost most of you on that last one, but I do love carrot cake. I've said this before, but no matter how you make it, I'll probably love it. With or without real chunks of carrots, kinda dry or overloaded with oil, it's all good? As long as there is a decent frosting (which there always is), then you're guaranteed a tasty treat. At least in my world, mmm, so tasty! 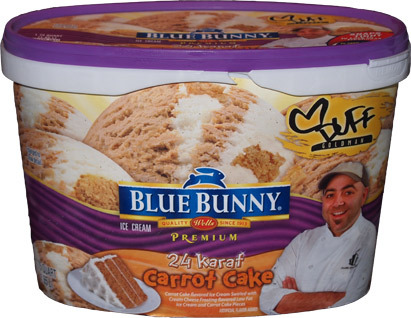 This is Blue Bunny's new Duff Goldman flavor. Not only was it a smart idea to continue the relationship with Duff, but they've gone and expanded it with this and the Cup o' Coffee Cake flavor. Looking back, the only other carrot cake flavor we've ever had on the blog was Ben & Jerry's Carrot Cake from late 2010, but that one was a bit of a cheat since they used a caramel ice cream base. Blue Bunny is going way more extreme by using a carrot cake flavored ice cream swirled with cream cheese frosting flavored low fat ice cream and carrot cake pieces. Quite a description eh? Note that there is no gooey frosting swirl here, it's been replaced with low fat ice cream. And here it is! Even smells like carrot cake! It's a neat looking ice cream. At first glance it appears the low fat ice cream outnumbers the carrot cake ice cream by about two to one. No worries, I can't wait to scoop and reminisce about one of my favorite desserts.... but there's a problem. To be honest, I'm 80% sure it's 80% my fault I don't like this one. You see, it's just not popping for me. I psyched myself up way too much for this flavor and there is no way it could have ever matched expectations. On Second Scoop: Confession time. The pictures you see above are from April 17th when I first tried this flavor. I was so perplexed when I first tried it that I wrapped the flavor back up, took it back downstairs, and grabbed something else.... and then it got buried under an avalanche of new spring products. We've been trying to clean the freezer this week and so I dug in and brought this non-chocolate flavor up to try again. I scooped myself another bowl last night and oh man does this taste like carrot cake. It's almost too similar, like my brain still doesn't know how to register it. What I do know is that it makes me feel like an incoherent blogger, but not every flavor is clear cut. I read the ingredient list and see oatmeal raisin base. You know, now that they mention it, that's what I taste! I mean I think I taste carrot cake, but it's more familiar than that. Now that I've read the ingredient list, oatmeal raisin is all that I taste. I do hit cake bits from time to time, but they don't really pop against the back drop of the consistently flavored base. I don't want to call it overpowering, the flavor is just always there. There are two flavored bases but it doesn't really seem to vary from spoonful to spoonful. I think the low fat nature is also creating an overall gummy feel to this one that isn't helping me fall in love. Sometimes I like products that aren't extreme but there's just something about this one that doesn't sit well with me. Maybe if this was a gritty froyo it would all make more sense. As always, I know there will be people out here that like this one, it's just not something I want to eat. I wonder what the quality of cream cheese they are using is? I'd think with something commercial like this their might be a fair amount of stabalizers, which wouldn't help you in the gummy department. Still, I will trade a bit of gummy for the mouthfeel of cream cheese frosting and carrot cake spice and sweetness any day. Nice review, Dubya. Haha, is your "On Second Scoop" title kind of like "On Second Thought"? I saw this and the Wedding cake pint at the store this week and can't wait to go back and try this one. Like you, carrot cake is my most favorite cake so I can't wait to see if I'm as disapponted as you, since I too have loft expectations for this one! hehehe, that is exactly what it's from! at no point did I even remotely think that this one tasted like frosting, not even a little. Bummer. I felt the same way about Carrot Cake. I love carrot cake, but this flavor just didn't get the job done for me. Hopefully this will be the next movement of cake inspired flavors for all the major manufacturers and we'll get to try some more carrot cake flavors. Dubba I got the pints 2 for $5 so I got this and the coffee cake one. Hands down carrot cake is my all time fav cake and lemme say this is now my most fav flavor of all time! First off, I didn't notice a smell of cake at all to the pint but omg the cake pieces are amazing! I def detected the oatmeal raisin base/nutmeg flavor and love how uncheesy the cream cheese swirl was. The B&J cheesecake pints get to be a little too much for me. I also tend to polish pints off like a linebacker and the quality of this ice cream was so fine I was satisfied with only half, a miracle for me! Can't wait to try the coffee cake!! I enjoyed BB red velvet (which had the required cocoa unlike B&J's offering) but BB carrot cake tasted like pumpkin. Maybe because of the heavy cinnamon & spice. Maybe because there's no carrot in it! The karrot cake was AMAZING!!!!! THE BEST ice cream EVER just got the new red velvet cake ice cream flavors today have not tried it yet. can't wait!!! where can I get it at ? 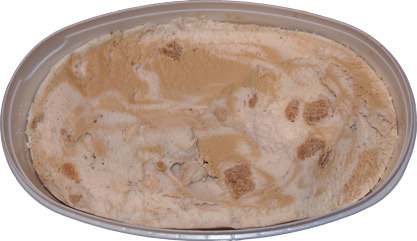 The worst fake-tasting carrot cake ice cream...No one seems to remember Haagen Dazs Carrott Cake a few years ago//SOOO GREAT!!!! !Like real homemade!! @Anon: Hi, not to be rude, but are you sure it was Haagen-Dazs? Usually the internet remembers but it doesn't remember that.